Istituto Svizzero is pleased to present “Sequoia 07”, the first solo presentation by Alfredo Aceto in Milan. Art, for the artist, is a pop game, and each work is thought of as a generic object, equivalent a priori, to any other. Bearing this in mind, the exhibition is thought of as a collage which connects these objects temporarily, transforming them into a game of memory and desire. The exhibition’s title itself toys with this collage concept. Aceto combines the recollection of a memory from his childhood, that of his grandmother telling him a story of some teenagers escorted by a woman riding a white horse through a tunnel of trees with Sequoia, his favourite 2007 Toyota car model. The automobile is the artist’s (Turin born*) frequent dream and a pop pattern par excellence. Its control panel is a recurring subject of his drawings; the many mechanical features of these objects are source of inspiration for his sculptures. The elements are fragments of a living contemporary dream, in which all already belongs to history. Time and space transform these objects into ones with decorative value. What may appear as an obsessive game, is rather Aceto’s desire to seek the lowest common denominator for an object to be a sculpture. On the one hand, he carefully picks the objects he is interested in and treats them with care and reproduces them, on the other, he deletes and suppresses their qualities by stripping them of all meaning. Anti-heroic by definition, these objects remind us of the evanescence of details, loving them while saddened of their transient state. Each sculpture resembles what can be glimpsed quickly from the window of a train: extremely fast moving but very accurate. If it is indeed a matter of creating a collage effect, there is nothing better than finding a common starting point, which “Sequoia 07″ seemingly does with the purposefully identical diameters of all the objects, thus making them relatively associable. Losing their original appearance as gargoyles, mufflers or enlarged jewellery, they are now fragments of distant but fascinating glances: a bright coloured postcard of a huge American car driving under a redwood tree. *Turin is an industrial city which, starting from the beginning of the 20th century, developed the most important automotive industry in Italy. Alfredo Aceto was born in 1991 in Torino, Italy. He lives and works in Lausanne since 2017. His environments are place to live, in which one can find a sort of melancholy, artificial time alteration and image saturation. 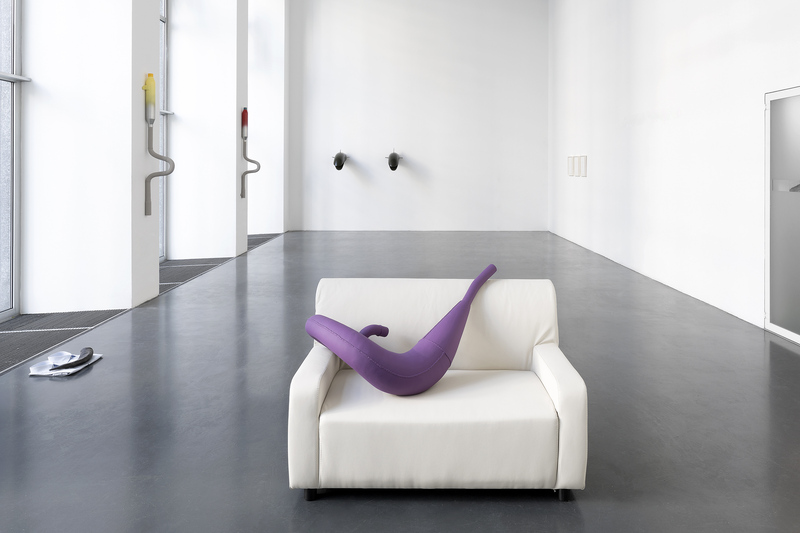 A former student of Philippe Decrauzat and Valentin Carron at ECAL (Ecole Cantonale d’Art de Lausanne), Alfredo Aceto has exhibited his work at Museo del 900 in Milan, Kunsthaus Glarus and Centre d’Art Contemporain in Geneva. His work is represented by Andersen’s Contemporary in Copenaghen, DITTRICH & SCHLECHTRIEM in Berlin and Levy.Delval in Bruxelles. In 2018 he was part of the Swiss Art Awards in Basel.